Who does not love a brunch of lox and bagels, a dish synonymous with New York but now enjoyed around the world. 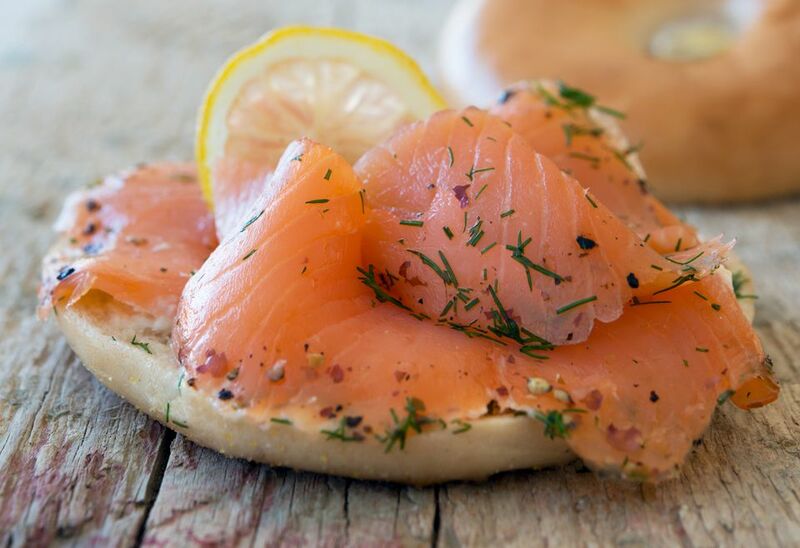 The lox now more popular found sitting atop the bagel is smoked salmon, not the true lox, which is a salt and dill-cured and seasoned rather than smoked. The method of preparing real lox is not dissimilar to preparing Gravad Lax, the Swedish salmon dish. For the home cook wanting to prepare real lox, the curing process is so much easier than smoking and the result will be a sweet, tasty and tender slice of salmon. Even better, the lox can be used on so many dishes not just for brunch. Lox can be sliced thickly and served alongside potatoes, especially when served with dill and horseradish—two classic accompaniments to cured salmon; tiny slivers served on blini as canapés with a dash of (again) horseradish; a straightforward sandwich on rye. Choosing the right cut of salmon is important to the success of this dish, use the thick belly section rather than the thinner tail end, the thickness is fattier and creates a much tastier lox. The salmon you use should also come fresh from the fishmonger or supermarket because as the fish is not cooked, it needs to be squeaky fresh. If you have any doubt about the freshness, do not worry, buy a frozen piece or, freeze for 24 hours before curing to ensure there are no parasites. Other than that, making lox is straightforward and once tried you will never go back to smoked salmon again. If using a frozen piece of salmon, defrost thoroughly before starting the recipe. Cut the salmon fillet into two halves cutting across the piece. Mix the sugar, salt, peppercorns chili (if using) juniper and dill in a bowl. Place one half of the salmon, skin side down, onto a long sheet of plastic wrap. Cover the flesh of the salmon with the sugar, salt, and pepper mix. Place the second fillet, flesh side down on top to create a "salmon-sandwich". Wrap the 'sandwich' tightly in the plastic wrap. Put the sandwich into a shallow baking dish; the fish needs to stand higher than the sides of the bow. Place a baking tray on top of the salmon and weigh down with a couple of filled food cans, or weights. Put the fish into the refrigerator and leave to cure for 3 - 4 days, turning the salmon every 12 - 18 hours. When ready to serve, remove the wrap, pour away any liquid and wipe away most of the sugar salt and peppercorns, leaving a little on the edges for decoration. Slice as desired for the end use; on bagels, the lox shouldn't be too thick, served with boiled potatoes and dill sauce, the slices should be more chunky. The lox will keep well in the refrigerator for five days. If you bought frozen or froze the salmon before curing, then do not refreeze. Add Alcohol. Both vodka and gin, or a little Pastis or Pernod, are delicious ingredients to add to your cure mix. A couple of tablespoons of one (not all) will add a lovely back note of flavor. Enhance the Color. Adding 2 - 3 tablespoons of raw, finely grated beetroot to the cure will turn the salmon a glorious pink-red color which on the plate is stunning. Substitute the Spice: Switch out the juniper for coriander seed, fennel (seed or fronds) or any spice you like.